Sally’s grandfather is a retired cartoonist. He creates the comic Marchmont just for her. This middle grade story blends the antics of Sally’s family life with the comic strip’s fictional characters. “The cape fills the page with crimson brilliance. Its color flows like a raging stream from one frame to the next. The fabric is smooth and inviting, yet dangerous and unpredictable. In the right hands, it protects the good while destroying evil. But the wrong person can cause great harm with the magnificent cloak. Samuel must never allow anyone access to his cape. The village of Marchmont depends on him to protect it." Sally’s grandfather is a retired cartoonist. He creates Marchmont just for her. 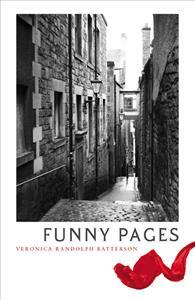 Funny Pages highlights Sally’s family life and the fictional characters of the village, Marchmont.